Nooshabad is a city 8 kilometers north of Kashan. Early this century, an underground city was discovered underneath it which was a manmade complex spread across thousands of square meters. The city consists of many labyrinth-like architectural structures, corridors, rooms and wells. 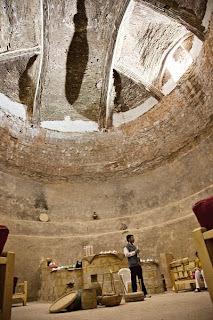 The history of the complex dates back to the pre-Islamic era, and was mainly used for sheltering and defense purposes. 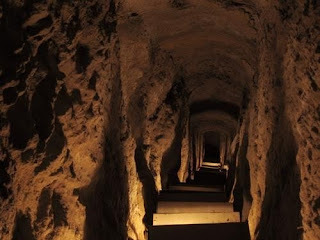 The city was built in 3 stories, the deepest at a depth of 13 meters, and each story 3 to 5 meters apart and connected to neighboring stories through vertical and horizontal canals. Entrances to the city were from population concentration points such as water reservoirs, markets, fortresses and also some individual houses. Except for the main entrance, all the other parts of the city were about 170-180 centimeters in height to let people pass without any problem. Some raised platforms were created in some walls for people to be able to sit. Rooms were connected through angled corridors (preventing direct sight) and also had access to toilets, supply stocks and a guarding place. Lighting was provided by fat burning lamps. Natural air conditioning and water supply of the city are among its ancient engineering wonders. The ventilation system used in the underground city through devising canals made it possible for the refugees to breathe even at a depth of 20 meters below the ground. 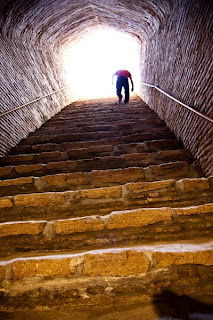 A large number of historic evidence including earthenware vessels and stone instruments ranging in date to Sassanid (224-651 AD), Ilkhanid (1256-1336), and Safavid (1501-1736 AD) dynastic periods have been retrieved from the underground city. After three seasons of performing archeological studies, tourists can once again visit the city from entrances adjacent to two old water reservoirs. Some facilities such as a teahouse in the first floor of this underground city have been prepared to welcome visitors and tour guides will be stationed at Nooshabad to explain some historic facts about this stunning underground city. A defunct sewage system has been posing a fatal threat to the underground city in Nooshabad. 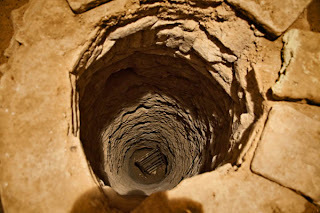 Locals have dug out wells in order to dump their sewage and now the leakage is threatening the underground city, having damaged some walls and providing a habitat for pests. 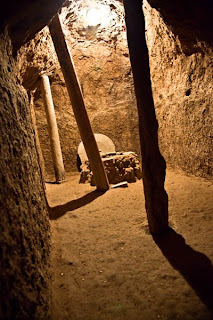 Ironically such illegal excavations were how the underground city was discovered to begin with. It was estimated that building a new sewage system would require over $500,000 of public funds.